The animal agriculture industry spends millions on deceptive advertising to persuade consumers that farmed animals roam freely on bucolic pastures. But I’ve been piloting drones over animal agriculture facilities for several years, and the video I’ve captured tells a far different story. Nearly all animals raised and slaughtered for food in the U.S. live in factory farms—facilities that treat animals as mere production units and show little regard for the natural environment or public health. Instead of creating widgets, these factories confine, mutilate and disassemble animals who feel pain and pleasure just like our dogs and cats. Aerial views of the first factory farms I visited—pig facilities—didn’t capture grass and rolling hills, but instead exposed rows of windowless metal buildings. Each confined thousands of intelligent, sensitive pigs who spent their lives on concrete floors in crowded pens. The footage also reveals what appear to be red lakes but are in fact giant, open-air cesspools. Waste falls through slats in the pigs’ concrete flooring and is flushed into these massive pits, which sometimes have the surface area of multiple football fields. To lower the levels of these cesspools, many facilities spray their contents into the air where they turn into mist and drift into neighboring communities. In North Carolina, this practice has been associated with spikes in blood pressure among community members and increased asthma symptoms among nearby schoolchildren. I spoke with neighbors who described walking outside and falling down in their own front yards because the stench of these factory farms made it so difficult to breathe. 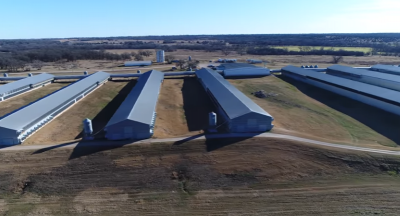 I recently piloted drones over factory egg farms, perhaps the most industrialized sector of animal agriculture, with each shed confining thousands of hens and some facilities holding over a million. If I hadn’t known better, I would have thought the 24 sheet-metal buildings were airplane hangars or industrial storage facilities. Mercy For Animals undercover investigations have revealed that hens inside such facilities spend their lives trapped in cages so small the birds can’t even fully spread their wings. Such confinement is so intensive that many hens die and decompose among cagemates still producing eggs to be sold as food. Indeed, drones have put to bed the myth of Old MacDonald’s farm. Armed with the truth, we must take responsibility. The practices exposed only exist because people purchase products of factory farms. Each of us has the power to stand up and vote against this industry by simply leaving animals off our plates. Mark Devries serves as special projects coordinator for investigations, with a focus on directing short-form documentaries about factory farming and animal rights. Before joining Mercy For Animals, he directed Speciesism: The Movie and conducted the world’s first drone-based investigation of factory farming. The movie is widely used as an introduction to animal rights, and the drone footage has amassed tens of millions of views globally. Mark is also an attorney licensed to practice in Washington, DC. Featured image is a screenshot from the video by the author.